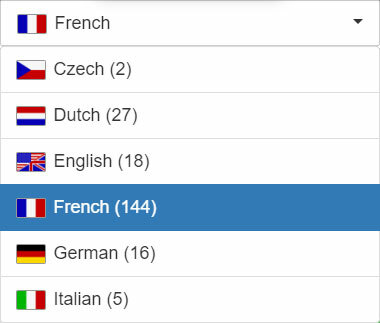 Above the list of stories to read, you can see drop-downs where you can select two languages (figure 1). The first language on the left is the language you are learning, ie the language in which the stories are written. You can also choose to select all languages, which will give you a list of all available stories. If you want to change one of the languages select another language from the dropdown list by clicking on the language (figure 2).